It’s been one year since you helped to launch our first hot food kitchen in Aleppo. That first kitchen was so successful, providing cooked meals five days a week for thousands of Syrians devastated by war, that we were able to open a second kitchen. Now, these simple kitchens are being used as a launch pad to serve even more Syrian families. Recently, some local friends wanted to try something new: sending food into a besieged Syrian city. They needed a place to prepare the food, and the kitchens you helped launch were just the right kind of place. Because the kitchens are busy all day, the staff decided to stay open for a special shift. Andre, the kitchen stock keeper, stayed all night, as did the women who worked to prepare boiled eggs and potatoes. 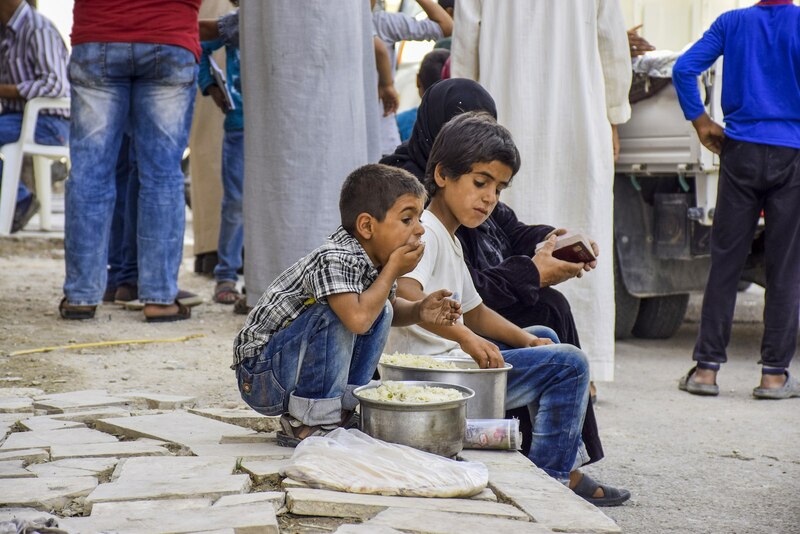 When this team entered Deir ez-Zor, breaking a three-year long siege, your hot food kitchens allowed them to serve cooked food to starving Syrian families. These are some of the stories they brought back. “We have had [virtually] nothing coming in or out over the last two years and nine months. Imagine: no meat, no vegetables, no flour, no cooked food or clean water”. The desperation of the residents was obvious as soon as the food distribution began. Young men who were starving ran over to the trucks and started throwing food to their families and children. A middle-aged man came up crying, seeing one of the delivery team members eating a cucumber. He said it had been three years since he’d seen one. Muhannad was so kind—he just wanted to be a friend. “When death and destruction is all around, it is faith in God’s grace that sustains us,” Muhannad said. Proudly he escorted the delivery team into his dad’s barber shop and gave them cold water—a very precious commodity. He wanted to throw in a shave but there was no time. Muhannad kept his spirits up during the long siege by studying. He just passed his baccalaureate and has chosen to study engineering at the University. The trip to Deir ez-Zor was dangerous, but well worth doing. No one on this distribution will forget the mothers holding their babies as they approached the trucks, tears filling their eyes and spilling down their cheeks as they reached out for the milk and cereal for their starving youngsters. This city has faced horror upon horror. It has been besieged for three long years. This first food delivery was an important sign of hope for residents, but the needs of this city far outstrip these kinds of aid deliveries. Families need regular meals—nutritious, sustaining food that will help them recover from prolonged malnutrition. Deir ez-Zor is still dangerous though, and the risks are too high for anyone to commit to a consistent presence. This is where you are stepping in. This month, you started a hot food kitchen in Deir ez-Zor, on a one-month trial. This kitchen will work like the first one you started a year ago in Aleppo. It will serve 5,000 families. Deir ez-Zor is still unstable—it is out of ISIS’ hands, but still within reach of their bombs. This project is not without risk. But Anis and Anis, Muhannad and those tearful moms—they convinced us that we have to make it work. You are the only ones serving inside Deir ez-Zor in this way. You are the first ones to set up a kitchen in the area. And if it is successful we hope this will give other organizations the confidence to work here too. In addition to feeding thousands, the kitchen will provide jobs for 50 women who will cook, and 50 men who will build the kitchen and distribute the food. A successful kitchen will move families from desperation to stability, which will open up other opportunities for recovery and rebuilding. The cycle of violence will be replaced with a cycle of hope. Desperation to stability, stability to opportunity—this is what you are making happen in some of the hardest hit communities in Syria.